Since I learned how to make a date nut bread recipe, it has become one of my favorites, especially for the holidays. I simply love the combination of dates with all kinds of different nuts. I use this combination in many of my holiday recipes; breads, cookies, cakes and puddings. 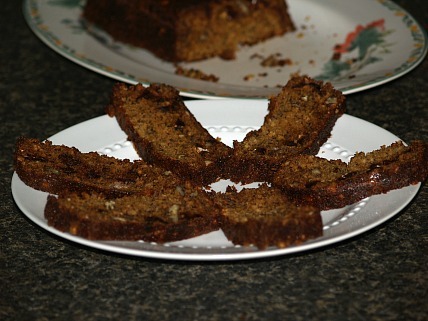 Most date bread recipes are quick breads meaning they are quick and easy to bake. Dates have been a staple food of the Middle Eastern countries for thousands of years but were not always plentiful in this country. When I was young, we were not privileged to have dates in our home. Perhaps that is why I love them so much now that I am older. Now they are found in every supermarket and are very assessable to all of us. The following quick bread recipe is easy and delicious. Combine the nuts, dates, soda and salt together in a large mixing bowl. Add the butter and pour the boiling water over the ingredients; Allow mixture to stand for 20 minutes. Beat the eggs and add the vanilla; set aside. Sift the flour and sugar together. Stir the date mixture to blend. Add the eggs and the flour sugar mixtures to the date mixture. Mix together but do not over mix. Put mixture in a greased loaf pan. Bake for 1 hour or until pick comes out clean. Cool before removing from the pan. When I learned how to make a date nut bread recipe I found it has the same basic texture and is made with the same basic technique as muffins. Being made with whole wheat, bran and wheat germ, they are great for breakfast or to pack for a trip. Some other great ingredients like dried fruit, nuts, honey or molasses add to more health benefits. Pour boiling water over 2 cups bran; let stand. In another bowl sift flour, soda, salt and cinnamon. Add wheat germ and remaining bran to flour mixture. Combine wet bran mixture to dry mixture; stir until moist. Add oil, honey, eggs, buttermilk, fruit and nuts. Pour into well greased muffin tins; bake for 15 to 20 minutes. 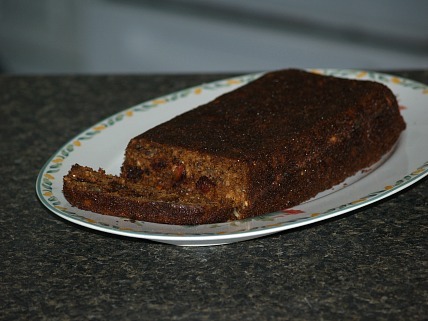 Learn how to make a date nut bread recipe deliciously flavored with ripe bananas. It makes 2 loaves and can be made ahead and frozen. Beat shortening until fluffy; add brown sugar and continue beating. Add eggs one at a time beating well after each; set aside. Combine bananas and vanilla; set aside. Sift flour, soda and salt; add to shortening mixture alternately with the banana mixture. Stir in dates, pecans and oats; spoon into 2 greased and floured loaf pans. Bake for about 55 minutes or until pick comes out clean; cover lightly with foil to prevent over browning. Cool 10 minutes and remove from pans to cool completely. This great date nut bread recipe is blended with apples. What a combination! Sift dry ingredients in medium bowl; set aside. In large bowl mix together milk, egg and oil; gradually stir in dry ingredients until well mixed. Fold in apples and dates; pour into greased loaf pan. Bake in preheated oven at 350F degrees for about 90 minutes or until pick comes out clean. Similar to the date nut bread recipe are muffins; most quick breads can be baked in muffin tins. Try this delicious orange muffin recipe with dates. Soak oats in large bowl with orange juice and boiling water. Beat butter and sugars until fluffy; beat in the eggs, oats and vanilla. In another bowl measure flour, baking powder, baking soda and salt; stir in the dates, nuts and peel. Add dry mixture to creamed mixture stirring only until moist. Fill greased muffin tins 2/3 full and bake about 20 minutes or until pick comes out clean. Combine nuts, dates, baking soda and salt in a large bowl; add shortening and boiling water. Stir to blend and let mixture stand 15 minutes. Beat eggs and vanilla together slightly; stir in flour and sugar. Add date mixture to egg mixture; stir only to blend. Place in a greased loaf pan; bake 1 hour. Cool before removing from pan; run knife around sides of pan to loosen. Preheat oven to 375F degrees; grease a 6 cup baking ring pan or loaf pan. Combine biscuit mix and sugar in a mixing bowl; cut in butter until coarse crumbly mixture. Stir in milk just until moistened; drop half of batter by tablespoons into prepared ring baking pan. Spoon date filling over batter; top with remaining batter. Bake about 30 minutes; invert pan onto platter and let set for 5 minutes before removing pan. To Make Date Filling: Cream 8 ounces softened cream cheese, and 2 tablespoons milk; blend in ½ cup finely chopped dates. Heat water and milk to 112F degrees; pour liquid into a large bowl and add yeast to dissolve. Add salt, oil and honey to the bowl; mix well. Add 4 cups of flour to the mixture and blend well with mixer. Stir in granola, nuts, dates, orange peel and 3 to 4 more cups of flour stirring to make a dough. Turn out onto floured surface; knead in remaining flour until smooth and elastic. Put dough in greased bowl; cover with plastic wrap and let rise in a warm place about 1 hour to double in size. Punch down dough and shape into 3 loaves; place in prepared pans. Cover and let rise again to double in size 50 to 60 minutes. PREHEAT OVEN TO 350F degrees; beat together egg and 1 tablespoon of milk; brush tops of loaves. Bake 35 to 45 minutes; remove from pans and cool on racks.